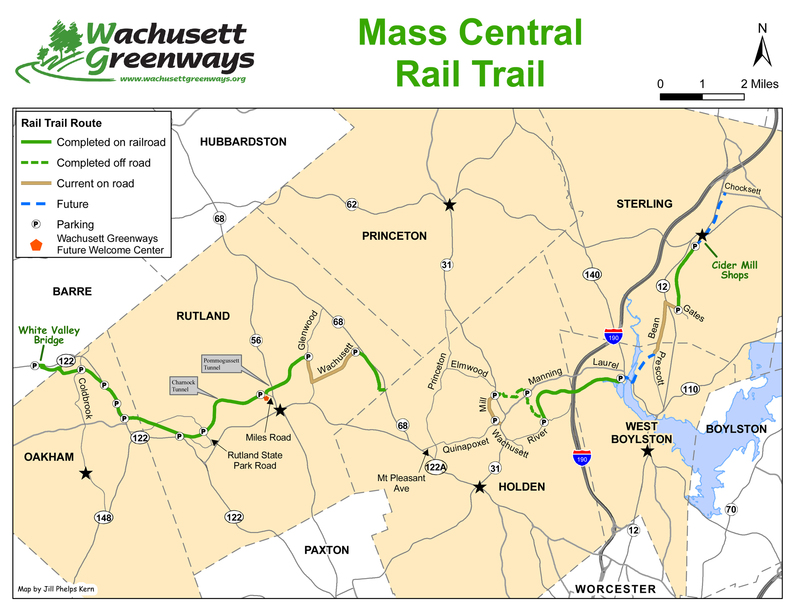 Here are Mass Central Rail Trail overview and section maps. On the section maps, red dashed lines (“Other Trail”) are walking paths only. Sections 7 & 8 (west of Section 6) are under revision and not currently available. Information on Mass Department of Conservation and Recreation (DCR) Authorized Bicycle Routes on DCR Wachusett Watershed lands is at http://www.mass.gov/eea/docs/dcr/watersupply/watershed/wachusettwatershedbikeroutes2016.pdf. A link to DCR Ware Watershed maps will be be added when available. Wachusett Greenways thanks Jill Phelps Kern for donating cartography for the Mass Central Rail Trail overview and section maps.